I know I’ve said this before, but I love Agatha Christie! I’m currently reading through all the books she wrote. This last September found me back in Torquay – summer home of Agatha and back at the much expanded festival for her. as I went many years ago and you can read about Take 1 here. This time was very different from the start! The festival was jammed with events – my favourites were the talks on her and her work by experts. I went with a friend who is also an Agatha fan, plus, my new puppy – Blossom. Sadly, the festival isn’t dog friendly – something I think Agatha see as a poor reflection on Agatha – she loved dogs! So, it did prove challenging to get to events and look after my dog. Venues are all over the town, so just getting to eat, let alone look after the dog was hard. Still I loved it and having her along, what great fun. 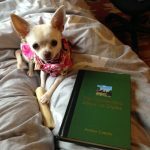 I did managed to bring her to a few things and no one batted an eye – Blossom is a very well behaved small chihuahua. You’d have to really be looking for her to know she is there. She managed to keep up with us on a few walks. 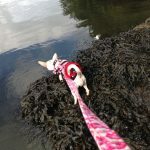 Blossom’s 1st experience with salt water at Greenway! We, also, found an air bnb which was a great location for the venues and was dog friendly. You definitely want to stay close to the city centre, as I mentioned the events are needing a car to get to them due to how tight the schedule is. We heard from those staying out a bit further, it was extremely difficult for them. Draw back of having to drive everywhere is you also have to pay for parking everywhere, so be prepared that if you want to make it to as many of the Agatha centred events, you need a car and lots of spare change for the parking meters. We bought the ‘Grand Tour’ tickets which included some brilliant extras and meant we didn’t have to fuss around with making sure our passes let us in – this covered everything with a few nice extras! Plus, if you did need to sign up, you could do it before everyone else, so we didn’t miss out on anything we wanted to see or do. Events I loved: Dr John Curran’s Mystery film, outdoor cinema, A Christie reference library with Dr John Curran, Agatha Christie bus tour, tour of the cinema Agatha went to, Christie on screen: Mark Aldridge, dawn walk to Greenway, with John Risdon and the Escape Room. At the end, I was pleasantly exhausted, enchanted and all the more knowledgeable about this lady of crime. Did you know she was the 1st female surfer?! I loved it and plans are afoot to go again. 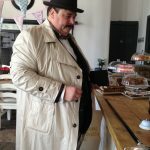 Even Poirot managed to make it along! I didn’t see much of Torquay or the surrounding area or get to stay at Burgh Island – a secret dream of mine. 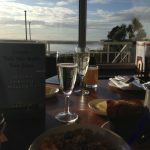 Plans are in the making of making that dream come true and I’ll share all about it once it’s happened, in the mean time, you can find out more about the city from my 1st blog on Torquay by clicking here. If you are a fan like I am, I would highly recommend going to the festival, getting the Grand Tour tickets and avoiding all the ‘extras’ events that having nothing to do with Agatha herself. They have expanded the festival to include events which are loosely themed around Agatha, but I didn’t find them at all of interest or helpful to expanding my knowledge of her, which is why I go. Have you ever been to the English Riviera? Where would you recommend going? Share below! P.S. : Just wanted to add, upon reading 1 of Agatha’s books, I came across an article from the 70’s about Burgh Island – I love it when life gives you these little moments – I think Agatha made a life time of writing by knowing how to monopolize such situations!